Status: Inactive; Active 1978-1994. Born: 1946-11-11. Spaceflights: 2 . Total time in space: 361.95 days. Birth Place: Moscow. Detachment: NPOE-4. Departed Date: 1994-02-18. Family: Cosmonaut. Country: Russia. Spacecraft: Salyut 7, Mir. Flights: Soyuz T-6, Soyuz T-10-1, Soyuz T-10, Soyuz T-11, Soyuz T-15. Agency: Korolev bureau. Bibliography: 6048. 1946 November 11 - . Birth of Vladimir Alekseyevich Solovyov - . Nation: Russia. Related Persons: Solovyov, Vladimir. 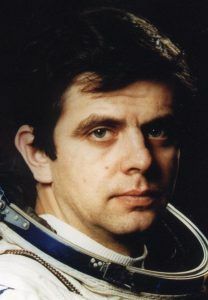 Russian engineer cosmonaut 1978-1994. Member of first crew to fly between two space stations during a single mission. Civilian Engineer, Energia NPO 2 spaceflights, 362.0 days in space. Flew to orbit on Soyuz T-10 (1984), Soyuz T-15..
1978 December 1 - . Energia Engineer Cosmonaut Training Group 5 selected. - . Nation: Russia. Related Persons: Aleksandrov, Balandin, Laveykin, Manarov, Savinykh, Serebrov, Solovyov, Vladimir.